They say many famous and great people came to taste this soup, though apparently not one of them thought to describe the flavor to anyone else. Maybe it’s because the soup had a hidden power. Yes… a secret power. One night, some esteemed guests find themselves suddenly sucked into a far-off galaxy! Maybe this is because they drank too much of the magical onion soup? Ladies and gentlemen: Welcome to Dr. Peace’s Strange Hotel. 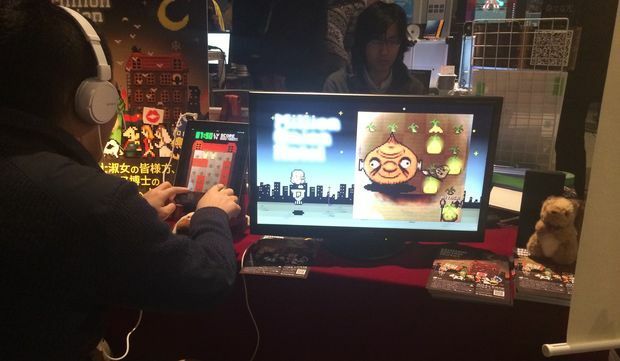 Million Onion Hotel was being shown at BitSummit today by two guys in onion hats. That’s what caught my attention first. But, upon coming closer to their booth, I saw an asparagus with a face spinning out of the ground and flying into the sky. That’s what really reeled me in. 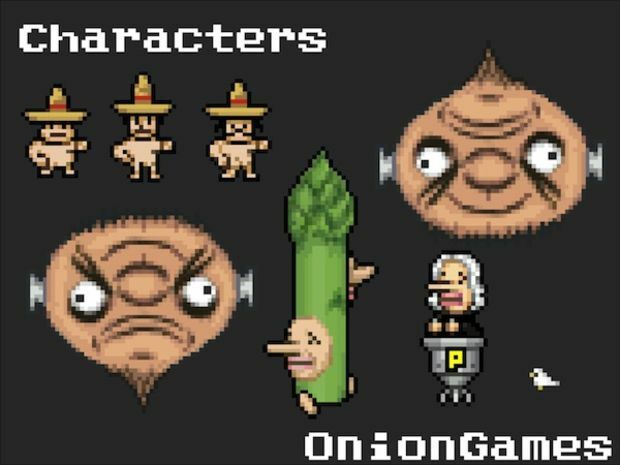 Million Onion Hotel is an iOS touch game that has players touching onions and other strange things that pop up out of the ground on a sort of grid. The goal is to clear all of the on-screen objects by touch before a timer runs down. Touching an onion adds a small amount time to the clock, and more challenging obstacles add even more. Occasionally, a time onion will pop up, and clearing it will add even more. Miss and time will be spent. I played it on an iPad that was propped up on an easel, allowing me to use all of my fingers for Onion’s multitouch play. Things started out slow, with one and two finger taps easily clearing all of the onions. Later, tougher onions come out that need more than one tap to clear. Bomb onions need multiple taps to clear; not doing so in time will have them exploding. What makes Million Onion Hotel so fun is that you’ll soon find yourself frantically tapping at all of the on-screen obstacles to keep up. It’s like Whack-a-Mole on crack. Crack-a-Mole, if you will. Fancy finger work was required to keep all of the pop-ups down after clearing the first stage. There were times I had to use three fingers on my left hand to keep tapping some of the tougher onions while quickly bouncing around with my right index finger to punch out all of the smaller ones that popped up around them. All the while, an underlying puzzle game is playing out. The onions sit on a 5x5 game board. Clearing an onion changes the square beneath them red. The secondary goal is to set up line clearings, with horizontal, vertical, and diagonal lines counting as valid plays. To be honest, I was so wrapped up in knocking out onions that I barely paid attention to the puzzle aspect. But I guess I did well enough, as I managed to clear the demo and see a tease of a big onion-faced boss. Clearing a stage reveals a bit of Million Onion Hotel’s story. The first cutscene I saw had two onions hopping out into the hotel restaurant. They quickly transformed into a butler and a pot of soup before the man and woman guests arrive to eat. I saw a peek of another cutscene where the two end up in their hotel room. In this one, their clothing magically disappears and they find themselves in a position in bed, all in one swift motion. All of this was presented in a cool, low-res pixel art style. The other thing that makes Million Onion Hotel so fun is that it’s so strange. Very strange. For example, a bonus mode has stars falling from the sky and cows mooing while onions pop up at an insane frequency. Turds with faces blob around the bottom of the screen for no reason, too. And that asparagus with the face is so weird that I was afraid to ask about it. The developers, Onion Games, are a small group, but their members have worked on some of my favorite games in the past. Director Yoshiro Kimura was a producer for No More Heroes and Little King’s Story, and did work on Romancing SaGa 2 and 3. Art Director Kazuyuki Kurashima was a character designer for Super Mario RPG, Little King’s Story and Live A Live. 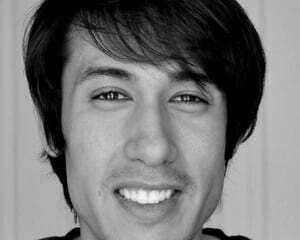 Game Designer Tom Ikeda worked on Rule of Rose, Lollipop Chainsaw, Harvest Moon: Tree of Tranquility and more. 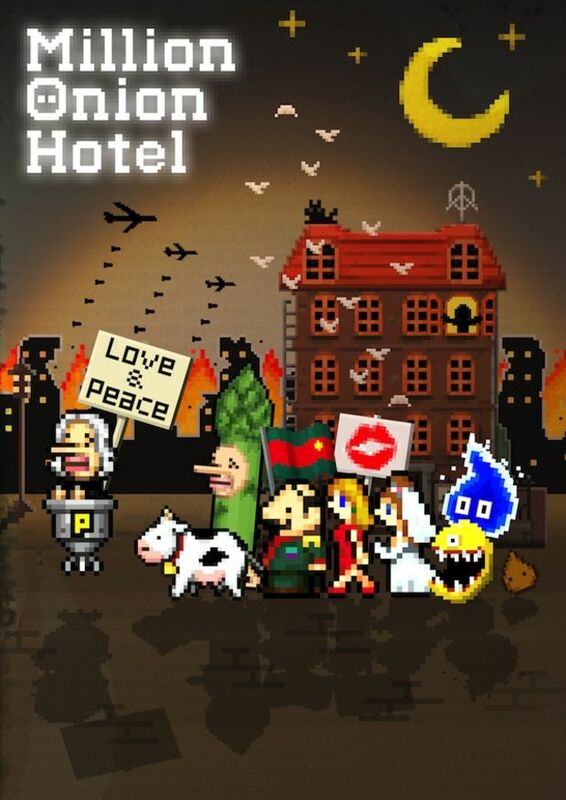 Million Onion Hotel will be released for iOS devices exclusively this year.